natural disasters are unpredictable, but the way the situation was managed in the recent Gujarat earthquake, for instance, has unearthed many flaws in the existing disaster management system. Unfinished rescue operations, food and water shortage and insufficient medical aid has shown that the country is not geared up to tackle such a calamity. The reason behind this is that India does not have a concrete policy on disaster management. In other words, it is taken as a fire-fighting process and more emphasis is given on developing the emergency response. This only creates more problems in the affected areas. Disaster management activity can be divided into pre-disaster, emergency and long-term post-disaster phases, which are inter-independent. Pre-disaster stage activities include preparedness and mitigation in a better and planned manner. The next phase includes rescue and relief operations. The third stage, post-disaster, refers to rehabilitation, which does not only cover rebuilding or repairing houses and roads, but giving crucial importance to the region if it is disaster prone. For the pre-disaster stage, disaster prone areas need long term planning, which includes preparing hazard zonation maps, land use zoning, modern forecasting and warning systems and creating awareness through education and communication systems. For mitigation, the areas need construction of disaster resistant houses and fortification of old houses in the sensitive zones, rehabilitating people to safer places. In the emergency stage, training people to handle disasters is important. 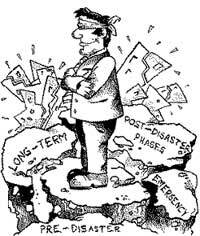 The third post-disaster stage covers four aspects -- politico-administrative, social, economic and environmental. The long-term rehabilitation of the affected people necessarily needs a strong political and administrative will as it includes many issues, which cannot be taken care without political and administrative support. To win over the situation, it is to be ensured that the project is acceptable to the political bosses and the administrators. The project viability is essential to win their support. Hence, a viable rehabilitation plan should be such that it is acceptable to the stakeholders. As the people of the region studied or affected are much attached to their land, culture and traditions, it is necessary that the plan cover their community values and education and health care systems. Hence, the involvement of the people at the planning stage is vital. The economic aspect covers agricultural, livestock rehabilitation and employment-generation schemes based on local resources. Small-scale industries such as handicraft, tourism and horticulture should be considered to revive the economy. The fourth aspect -- environmental -- is of critical importance in sensitive and fragile zones. The population pressure and unscientific development activities in disaster prone areas degrade the environment, which further aggravate the vulnerability of the area to disasters. Development should be carried out in such a manner so that the ecological balance is maintained. It is also essential that a land treatment plan is prepared integrating all the major departments of the area. All this will certainly help in making the area more or less stable and resistant to disasters. For appropriate disaster management, it is essential that all these four aspects are given due importance while formulating policies and implementing them. But past experiences reveal that while managing disasters, only politico-administrative and economic aspects are given due importance. The other two are either neglected or misunderstood, due to which the entire exercise goes futile and only adds to the suffering. The main problem in the field of disaster management is resource crunch. The central and state governments are unable to bear the burden of huge expenditure for rehabilitation. In the areas with continuous threat and frequencies of disasters, disaster mitigation activities should be considered as developmental activities or vice versa. Various development schemes or programmes run by different ministries and departments should be incorporated for disaster management with slight modifications. Simply by adjusting or slightly modifying the schemes, disaster mitigation activities can be carried out at a minimal cost. But at the same time, it is essential that all developmental or rehabilitation activities be tailored to meet the basic needs of vulnerability reduction, survival and recovery.